The Iraqi city of Tikrit - currently at the centre of a military operation aimed at driving out Islamic State jihadists - is known as the birthplace of two famous leaders. Medieval Kurdish Muslim commander Saladin Al-Ayyubi and, more recently, former Iraqi President Saddam Hussein both hailed from the city. But it is the legacy of Saddam Hussein that lingers in the minds of Iraqis and gives Tikrit the strong symbolism it has today. It is Saddam Hussein who put Tikrit on the map of Iraq. During his time as leader, it was a place that one was proud to be from. Yet now it is an embattled city whose residents have fled. Tikritis are predominantly Sunni Arabs. In general, they enjoyed power and prestige during the rule of the former president and often boasted of their ties to the city, which lies about 80 miles (130km) north-west of Baghdad. Many residents held senior positions in Saddam Hussein's ruling Baath Party, government offices and the army. It was in fact the people of the small village of Al-Ujah, south of Tikrit - Saddam Hussein's birthplace and home of his clan - who really held power. Prior to 2003, many Iraqis viewed Tikrit with envy. They considered it to be favoured by Saddam and therefore to have better infrastructure and services than the rest of Iraq, though this may not have been the case. Tikrit's palaces also have a somewhat mythical status. 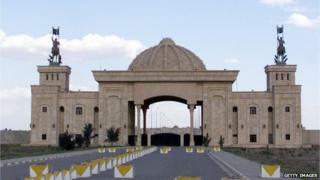 The city is widely cited as having the highest number of luxurious palaces built during Saddam's time, with reports putting their numbers between 60 and over 100. Tikritis however say there are fewer. The most impressive of these palaces lie within the Tikrit Presidential Palaces compound on the Tigris river, out of sight behind concrete walls. Control of these palaces moved from Saddam Hussein, to the US forces, then the Iraqi government, and finally, since June last year, to the jihadist group Islamic State (IS). Human Rights Watch identified one of the palaces as the site for a mass killing of Iraqi Shia conscripts by Islamic State last June. Things changed for Tikritis after the US-led invasion of Iraq in 2003 and the overthrow of Saddam Hussein. The tables turned and Iraq's majority Shia, whom Saddam had marginalised, effectively ruled the country. Tikritis outside the city kept a low profile as they became soft targets due to their real or perceived association to Saddam Hussein. When sectarian violence reached its height in Iraq in 2006, many of Baghdad's affluent Tikritis moved back to their city and it became relatively stable compared to fellow Sunni provinces like Anbar. Islamic State easily captured Tikrit in June 2014 after swiftly taking control of Iraq's second biggest city, Mosul. While residents were initially assured by militants that they would not be harmed, many soon left the city to avoid being caught up in the battles between the jihadists and the Iraqi government forces. Very few of Tirkit's original residents remain there today. Tikrit became the site where the jihadist group massacred over 1,000 young army recruits from a military base called Camp Speicher in June 2014. Some unverified reports linked some Tikriti clans to the killings. This did not help the reputation of a city that was already under the shadow of its past association with Saddam and his Baath Party. The Iraqi government offensive announced on 1 March to recapture Tikrit from Islamic State has given rise to concerns of reprisal attacks against Sunnis living in or around Tikrit by Shia-dominated paramilitary forces fighting alongside the Iraqi army. Today, Tikrit's displaced residents, like those of other areas taken by Islamic State, long to return to their homes and jobs. But they worry they might find little of that left once the dust settles and the battles are over.